A couple of years ago, my husband and I drove up to Banff National Park in Alberta, Canada. The day that we arrived, a huge rainstorm passed over us. The rain’s driving force was so powerful that it completely cleaned our vehicle. The sky turned crystal blue. On our way to Lake Louise I saw many cars pulled over and people standing with their cameras. “Pull over, pull over!” I said to my husband. I jumped out and leveled my camera just in time to catch the hindquarters of a grizzly disappearing into the vegetation. Check that off my list. Yay! 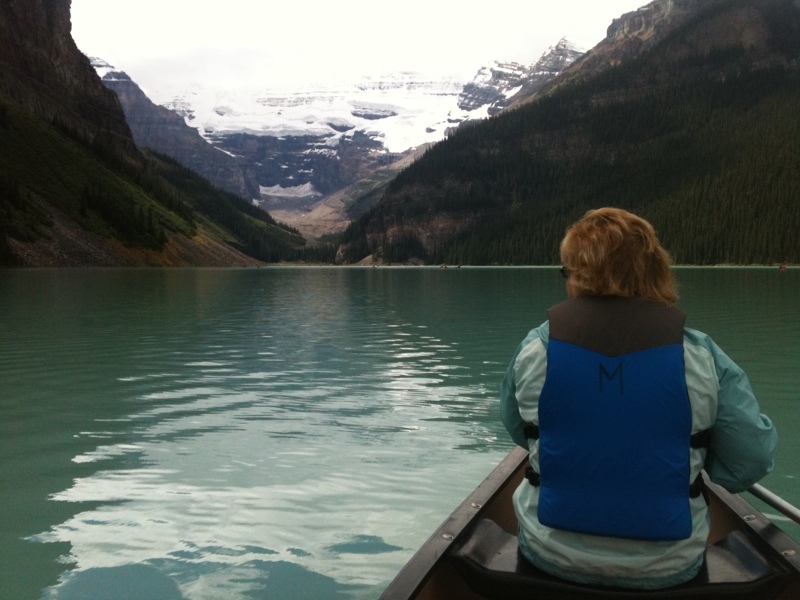 Anyway, we buckled our life vests, climbed into our canoe and rowed way out onto the lake. The water was an amazing opaque turquoise. Locals explained that the milkiness was the result of glacial silt, washing down from the glacier above the lake. Check two! Afterward, we wandered over to the Chateau to have a look see. Very British inside. Expensive stores. A harpist played next to the entrance to a restaurant. We found out that we had just missed tea time. But the restaurant that looks out on Lake Louise was still taking reservations. We signed up, waited a good hour, then were finally seated at a table next to a magnificent window overlooking the lake and the distant glacier. The meal was great but very expensive. The service was amazing and the waitress made us feel as if we were the most important people on earth. Well worth the hundred and fifty dollars for lunch. Check three. Thank You, God! I’m glad that not every day is so perfect. It’d be easy to get spoiled! That must have been some lunch! Not a chicken salad sandwich for sure. Wow! I don’t know if I would have gotten out of the car if I saw a grizzly. Edit that: No way would I have gotten out of the car even if he was making a hasty retreat. LOL! Mom and I had a special day like that yesterday. After struggling through the trauma of a broken hip 6 weeks ago, she was well enough to have some fun. We had a girls’ day out – hairdresser, lunch at The Olive Garden (our favorite), and shopping. It gave both of us a much-needed boost.